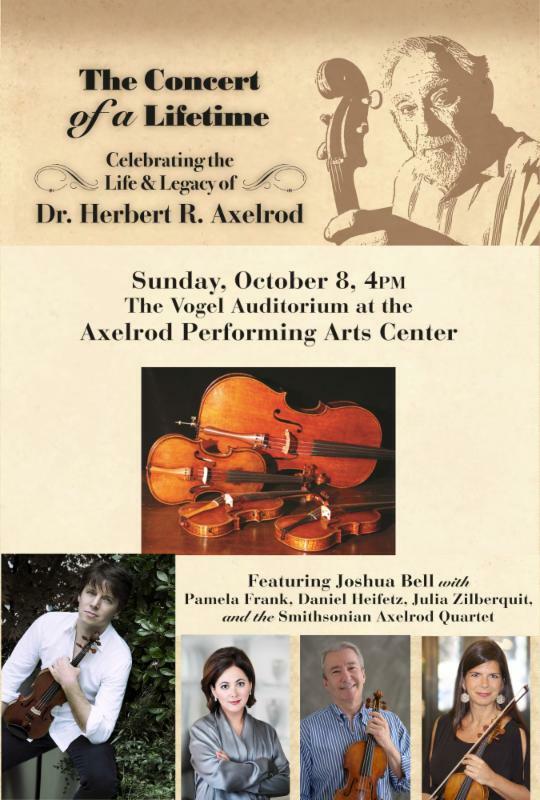 "The Concert of a Lifetime" on October 8 is a tribute to the late philanthropist and theater namesake Dr. Herbert Axelrod. This event will help establish an endowment for the arts at the Axelrod PAC. The concert features classical music giant Joshua Bell who was a personal friend of Herbert and Evelyn Axelrod (Deal residents for years) as well as a number of other well- established musicians. The concert will open with the Smithsonian Axelrod Quartet, the four matched Stradivarius instruments that Dr. A personally reunited (a long quest in days before the Internet) and then donated to the Smithsonian Institution. This concert will be one of their rare appearances in the Tri-State area. We are thrilled to welcome Joshua Bell to our theater as well as the esteemed players of the Axelrod Quartet as well as the other performers from New York City and the Curtis Institute of Music in Philadelphia.